Posted byEric Mesa	 17 Apr 2010 15 Apr 2010 3 Comments on Analog Strikes Back! It would seem insane to even consider getting into analog photography in 2010. But, as I wrote in my tet travelogue, I’ve been bitten by the bug. I think, had I been able to take photography classes and develop my own negatives and learn about aperture and shutter speed and all that with analog cameras, I might not feel such a need to discover the past now. But, when I get an idea into my head it’s pretty hard to dislodge it. Additionally, I see all these photographers on flickr waxing about how they have discovered or rediscovered film photography. Another photographer whose blog I have been reading recently wrote an ebook about how he has rediscovered film and will now shoot both film and digital. All this conspired such that recently I went through another round of deciding whether I wanted to do some film photography. I looked through B&H‘s catalogue of new medium format cameras. The only camera I could afford that wasn’t a Holga or other Lomography camera was the Chinese-made Seagull Twin lens Reflect Camera GC-105. I spent an hour looking for a flash unit what would work with the Seagull, a light meter, and film. Then I looked on the net for opinions of the Seagull and they were mostly negative. I went back to B&H and deleted the items from my wishlist. A few days later, I returned to the subject, common for something that has latched onto that part of my brain. I found a few people saying that others were being overly critical of the Seagull – it was good for at least a year’s worth of photography. So I was faced with the practicality of spending $200 for a camera that might last a year for a format I might not like beyond my first roll. So I spent Saturday and Sunday doing research when I wasn’t spending time with my wife fixing up the house and doing chores. Eventually, it appeared that the overwhelming opinion was that one should get a used Rollie, Yashica, or Minolta rather than a brand new Seagull. So I hit up Ebay. I hadn’t used Ebay since some time in college when I was searching for a cheap laptop. I became disillusioned with the site when every single auction I was involved in had me lose literally in the last minute. I would be winning an auction for days and then suddenly someone would beat me by $2. I still think that Ebay would best be served by having some more AJAX-y elements so that I can watch an auction in the last minute without constant refreshing. So, without thinking I would actually win, I bet on a few Yashica TLRs. (The other cameras cost in the thousands of dollars! Talk about maintaining value!) I actually won an auction for a Yashica A TLR. I thought I could then back out of the other auctions, but I found out I couldn’t. This, of course, makes sense. If I were winning an auction and then pulled out, the price would drop. Someone could legitimately complain that they would have bet on it with the lower price. Plus, with all the auto-bidding, it would wreak havoc on Ebay. Luckily for me I lost the other auctions. Most of the message boards where I was getting this advice were written in 2001, leading me to believe that I’m probably in the tail end of this film photography renaissance. I think 2001 was a key time because digital cameras were just starting to get really good, but there weren’t many affordable cameras that were even matching the quality of 35mm just yet. At any rate, it appears that I may have been wrong about being in the tail end of the trend. More and more people are trying to snap up film cameras while most camera manufacturers have abandoned their production. So prices have jumped up in accordance with supply and demand. While most of the forum posts were mentioning cameras in the $50-$100 range on Ebay, most of the ones I’ve found were starting at the $100-$150 range. And, many of the auctions I lost had the cameras going for $200! If you ask me, it appears that the camera manufacturers are leaving money on the table. There appears to be a market for film cameras that is left unfulfilled and so prices on the used market continue to increase. While they should continue to focus on digital cameras, I think they would probably make a decent profit with just one film sku. So far only a few medium format camera companies (where margins are high) have continued to produce film cameras. I also bid on, and won, a German folding camera that just looks amazing. Even if it turns out the seller was lying and it doesn’t shoot photos, it would be amazing as a prop/conversation piece, so I was happy to win that for just a little over $50 with shipping included. So, I ended up with two medium format cameras for less than the price of a Seagull. Now I needed film! 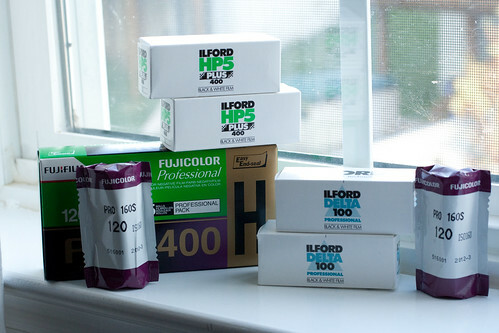 So I went to B&H and snapped some color and black and white film in the ISO 100 and ISO 400 range. (Basically daylight and cloudy/evening) But now that it was so close, I got impatient. Most likely my auction winnings would not arrive before this weekend and I couldn’t just have unusable film sitting at home! 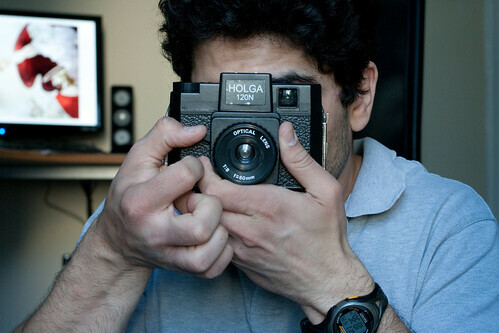 So, despite what I said in my previous post, I bought a Holga. I regret not getting the one with flash, but without flash it was just $30 – easy to justify if it turns out that my initial misgivings with Holgas were right! But with flash I’d be able to use it indoors at an event I think would benefit from a shot with a Holga just because it would be SO different from what everyone else is doing. So right now I’m brimming with excitement and fear. I’m excited at being able to use 120mm film – linking me to many of the great photographers of the past. I’m excited at owning a piece of history with these old, used cameras. 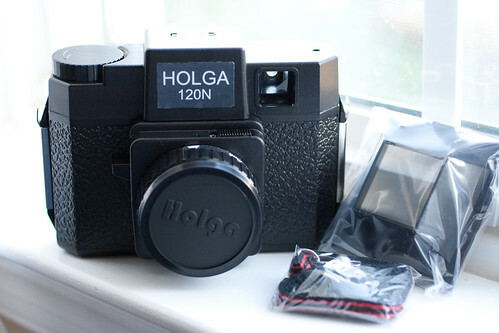 I’m [less] excited about seeing if Holga is all hype or will become an addiction. But I’m scared (although that’s really too strong of a word) that I’ve just wasted money that could have better gone towards my Canon gear. After all, I know that no matter what I’m not about to give up digital photography. It’s the only way I can afford to take all the shots I want, it’s the only economical way to experiment or take self-portraits, and there are many other benefits. Although may photographers will scold me for this, what I love the most is the ability to fire off nearly 1000 photos at a wedding and select the best one. Or with my wife’s cousin’s toddlers. Sure, I’m not developing the same skill as the photographers of old who had to capture that right moment, but I can capture all moments and then present only the best ones to the subject. Also, by shooting off tons of shots you increase your chances of getting a spontaneous exchange. For things like fireworks, you could waste tons of film on blank exposures, but with digital you can get it right. But I think it will be worth the experimentation and I hope that it holds enough attraction that I may consider using it for special occasions. Pingback: It’s A Binary World 2.0 » Is It Really Technological Progress? Can I just say that I LOVED reading this!! I think it’s great that you are taking the time and putting in the effort to learn film photography (and I think you’ll find it will have a positive effect on your digital photography.) I learned on film when there was no digital, and just never let go of my old school ways. About the Seagull, it’s actually great quality for what it is – a plastic camera. People who are saying otherwise are obviously expecting the quality of a metal body and glass lens, and you just won’t get that with plastic. That being said, the Seagull isn’t at all a bad option for an inexpensive TLR, I had one years ago but I lost it somewhere along the way… You can also find way better deals on ebay if you know what to look for; there are tons of gorgeous SLRs getting tossed away at the fraction of the price all of the time. Anything fully manual that was manufactured before the mid-80’s and in good working condition should definitely be worth a try. Thanks for taking the time to let me know how you felt about it. One of the greatest joys of creating – whether it’s a blog or photography is knowing that others are taking it in. I’m really, really enjoying the film photography! I have taken a few more rolls and I just need to get it developed soon!